Yesterday, while walking along the Ventura beach promenade with my dogs, I watched a very fit, flexible young woman trying to teach her very fit, muscular, stiff boyfriend how to stretch. First he tried to follow along with her moves, and she would laughingly try to correct him. The poor guy was in a hopeless battle between his tight hamstrings, pelvis, and lower back! He kept unconsciously bending his knees, because his typically tight hamstrings made moving his pelvis and bending forward or stretching sideways from his hip hinge virtually impossible. His well-meaning girlfriend kept reminding him to straighten his legs, and then she would briefly hover over him, trying to get him to lengthen his spine. Then she would give up and go back to her own stretching. They noticed me smiling, and smiled back. I picked up that they had an accent, German or Russian (later they told me they spoke both languages). So finally, when I could bear his suffering no longer and I worried he might wake up with a backache, I stepped closer and suggested he try the same stretches with his hands on the nice, sturdy metal railing that faces the ocean. Voila! In a matter of minutes, with his outstretched hands supported on the railing instead of dangling in mid air, the tug of war between his hamstrings, pelvis, and lower back was over. His spinal column was nicely lengthening instead of being increasingly distorted. Moral of the story: You don’t have to be flexible to create healthy, healing alignment. 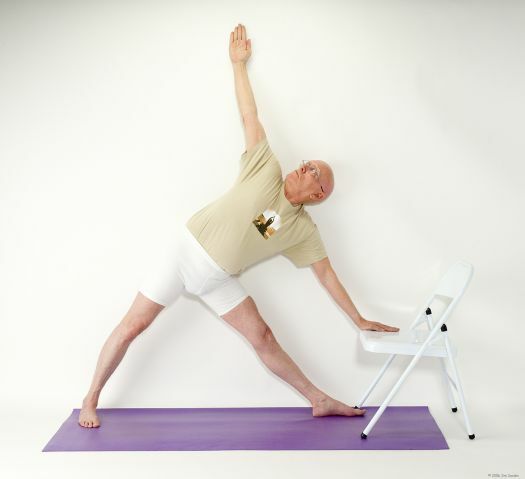 If you look with X-ray eyes at this photo of a beginner in his seventies, you’ll see that his skeletal structure in the classic Extended Triangle Pose (Utthita Trikonasana) is beautifully aligned.